Where to start from Helen Duggan’s kind nomination – I’ve only been running for four years, a member of FRR for two, I have no trophies, never ran an ultra-marathon, only ran one marathon, I’ve been fortunate to only sustain a couple of minor running injures, I haven’t saved any cats from burning trees, nor assisted our captain in purchasing his extremely tiny shorts. And Helen you were concerned about being a Runner Profile fraud? I enjoyed sport at school – mostly rugby and at college – mostly drinking, although I never achieved anything of great sporting significance. Whilst at College I undertook my Duke of Edinburgh gold award and found I really enjoyed the expedition side. After this I continued to enjoy walking and climbed Snowdon and completed the Yorkshire three peaks. Was this the early links to running, who knows? Fast forward several years that very life changing (plus very expensive) phenomenon called being a parent, further promotion at work to an even greater sedentary role and before I knew it my sole exercise was cutting the lawn. After realising how little exercise I completed, additionally nearing that middle-aged man crisis thing, I decided to have a go at running. 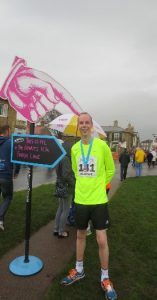 I began trying to run in the summer 2014 after my wife Bridget had completed a Couch to 5k Race for Life Race. How hard can that be I said to myself? I still considered myself reasonable fit…. Well I couldn’t run 5k without stopping nor 2k, but with time, the distance, relative speed and endurance slowly increased. I was ready for my first 5k race, albeit it is not a race but the inaugural Kesgrave parkrun in 2014 was the ideal occasion. A cracking late September Saturday morning, and it literally cracked with thunder and lighting, followed by a downpour to wash what little hair on my head clean away and that was just running to the venue. A very soaking wet runners brief and a waterlogged course it was, despite this I was hooked on this free weekly timed event with an abundance of friendly, supportive runners and volunteers. 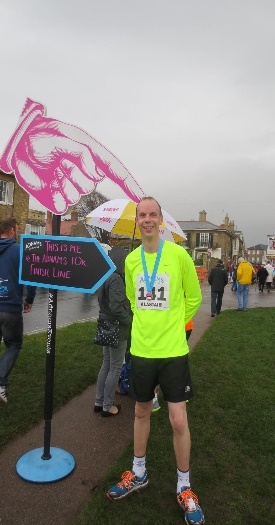 My first ever tangible race was Southwold 10k in late Autumn 2014, I had never been involved in any form of racing since school and this was a grown up affair with real athletic runners. I didn’t truly know what to expect, I got to the start line and stood at the back of the group. Never realising that the moment they said go it took almost a minute to cross the start line! The race went well, and I enjoyed every minute of racing. A few more races and my fondness of the weekly parkrun I found my times were improving. 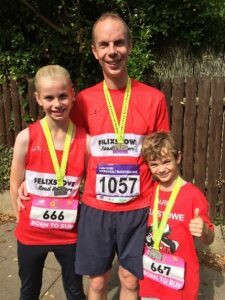 My children Harry and Jessica took an interest in parkrun too, along with Bridget and it had turned into a Saturday morning family ritual. Now a seemingly large proportion of these friendly and supportive people we noticed were all part of a running club; family membership purchased in 2016, the Reads had joined the Reds. As well as being a friendly, supportive inclusive bunch I had noticed that they support with as much enthusiasm and vigour as they run. This I particularly noticed whilst supporting Bridget on the 2015 Ipswich Half, The Woolpack had become a large, very vocal cheering and refreshment FRR zone. May 2016 was my first race as a club runner at the Alton Water 10k. I was starting to learn that you need to be a bit more competitive with the forming up at the start line as well as during the race. All I wanted was to get into the top fifty male finishers as you get awarded a free T-shirt (I still prefer T shirts to medals, *queue the pantomime boos from the bling lovers in the club). Race completed on a very warm day, position 35 overall, I was happy with that and more importantly I got the T shirt. I was talking to an FRR cyclist that I had not met before and explained how I got held up on the first 2k due to the narrow course, he provided me some advice on how I should be more competitive and those mortal words “back yourself”. 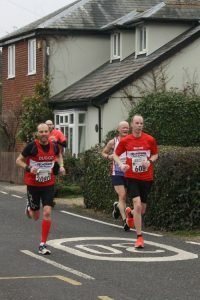 I was hooked, next was Woodbridge 10k 2016, running in club colours was a pretty good feeling, combining it with the carnival atmosphere of Woodbridge and you have a special running occasion. Again, the FRR support was immense, they appeared to congregate around public houses here too! Whenever I mention that I’m a runner, most non runners say, “it’s bad for your knees” and ask “have you ever completed the marathon” furthermore most runners assume that you have run a marathon too! So, to celebrate my 21st Birthday (plus 19 years) l decided to run a marathon, Dublin was duly entered. A small contingent of Reds were attending this fine city too, it had the making of a quality weekend. Race numbers collected, hotel located after a seven-mile Dan Clark guided tour of similar hotel names in Dublin. An evening meal with most of the team was a subdued affair to normal social meetings. 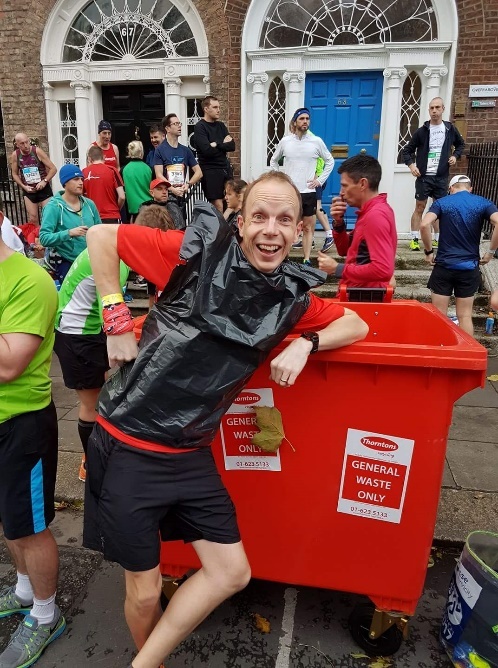 Race day, I was relieved the day had arrived, self-doubting my ability I put myself under pressure which was taking the shine off the marathon training and the event. I always enjoy the buzz from pre-race nerves, so race day was a good day. 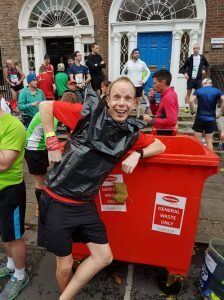 Being the newbie at the marathons, I thought I’d dress like a pro with the bin liner to keep warm while awaiting to start. I’m glad I entertained the fellow experienced marathon runners of the club with my attire. The Irish national anthem played causing a lump in my throat to appear. The first group was off, waiting for the ten minute delay for the second wave seemed to take forever. I was in the second wave pen, as I wasn’t sure what time I was going to achieve when I entered. Training had gone better than expected and I now wished I was in the first wave as most of the Reds appeared to be in this group too. Finally, we were off, remembering all the advice I had been given by various members, especially the one we use, that I can’t use in print. The race was going well, I was catching up the group ahead which was a great boost, pacing was on track. Half way passed with great scenery and epic support, the crowd just wanted to give you sweets, full size chocolate bars! With all the advice I was given no one mentioned the emotional side, it was completely unexpected and took me by surprise. I almost started to blub while running for no real reason, a good telling off to myself and the rest of the race went well and to plan. The finish line was a bit underwhelming if I’m honest, I crossed the line, grabbed my goodie bag mumbled to Dylan that I couldn’t see very well and walked off. The time I achieved was great, although I did feel a bit of a fraud as many better runners than me had tried and not achieved this time, and there was me a first timer completing a sub 3:30. The after party was a memorable occasion with the mass Reds celebrating in style additionally we were lucky we didn’t get thrown out of the pub. A great morning after the night before, with Matt Howe and FRR’s Ant & Dec equivalent, Dan Clark and Shaun Good, the food was good, the Guinness was great and the company wasn’t bad either. It was an awesome weekend with more great friendships formed. 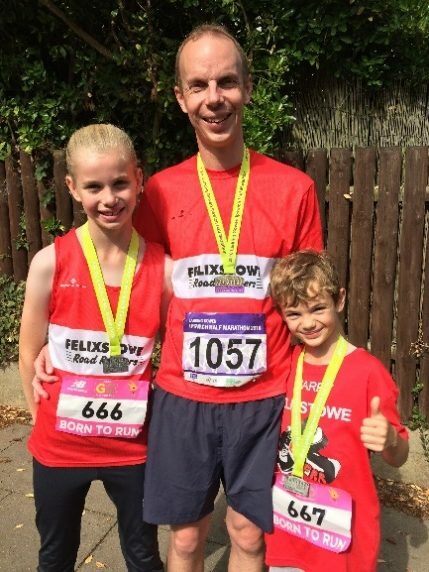 If I’m honest I am not sure if I really enjoy marathon running…. but I’ve entered two more just to find out! I remember going running with Ian one Wednesday night along with that running, singing Elvis bloke aka Simon Goldsmith, they nearly broke me. That evening run become a regular occurrence on a Wednesday from Kesgrave High School, the KHS Run Crew was formed and still going strong to date. I have been privileged to clock up many miles with Duggo whether that be training runs or races. To start with it was like having your own personal coach, his pacing is a thing of exquisiteness and he achieves this while talking and never appearing to look at his watch either. My speed was increasing, I even managed to keep him in my sights during races. 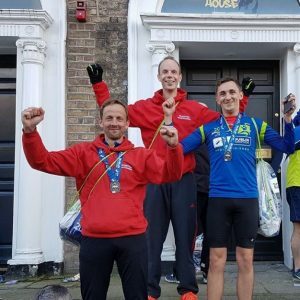 I have been very fortunate that my running progress has been improving which has enabled me to close the gap between some of those faster club runners. I recall the first time I ever managed to overtake some club running royalty, I wasn’t sure if I’d got the distance wrong and I was going too fast then when I did pass them would I get struck by lightning. The pre-race camaraderie, running alongside/racing against and post-race analysis is something I always enjoy with the club. Twilight 10k 2017, (never realised I could run that quick). Woodbridge 10K 2018 (if Carlsberg did 10k runs this would be it) fastest 10k time to date. Colchester half 2018 with wingman Duggo, fastest half marathon time to date, we ran the entire route together and couldn’t shake each over off on the final mile, so ended up crossing the line together. Although Bridget is still convinced we were actually holding hands! Duggo still claims it’s his world class pacing that we achieved such a good time! The stand out run and where it all began is a rather repetitive course, its free, weekly, non-competitive – Kesgrave parkrun in 2018. I had been chasing a certain sub time at Kesgrave parkrun for what felt like a long time, it was proving elusive too. Finally achieving it seemed to capture my running journey from when I was happy with sub 25 minutes a few years ago and now achieving a time that I never thought was possible. Other annual favourites include: Captain Harper‘s tinpot classic of Bungay Festival of running (I highly recommend the half!) Haughley Park Cross Country, Brantham 5 and Christmas Eve 5k’ish at Royal Hospital School Holbrook to name a few. What’s next on the racing calendar; the quest to assist the club towards Grand Prix dominance for a third consecutive year (and try to cling to the Male V40 category during the process) additionally there’s a “fun run” around a Southern Spanish City with a few other club members in early December and then to be repeated in our own capital city in 2019! What have I achieved since running; I’ve mastered the bushman blow, I own more trainers now than I ever did in my teenage years and I’m probably fitter now than I was in my thirties and dare I say even my twenties and made some great friends from a fantastic running club. My only award I can claim is AOTD by our very own Mr “Back yourself” Solly, after competing in the Christmas Eve 5k run at Royal Hospital School, what a start to the festive period with mulled wine and CAKE! I have gained a few nick names since joining FRR. First there was Fake Neil, then Readie or ‘Ready’ whilst in Ireland. Well that’s all folks from me; Let’s keep running hard, supporting like only we do and celebrate our success in the true style of FRR. Bring on the Valencia Marathon! (please note other races are available). Someone who is smashing out PBs on a regular basis this year, our one and only Sally Solomon – over to you!